Watch two of the world's most powerful motorsports Tractor Pulling and Drag Racing off the same viewing bank at the same time! Why not enter your own road car/ bike and have a go down the drag strip in the run what ya brung? Watch the pro racers in the Outlaw Anglia and Super Twin Drag Bike classes, nostalgia racing from the Wild Bunch and National Sprint Association together with the junior classes in dragster and drag bike. www. midlandtractorpullers.co.uk will have more information and start times in the next few weeks. Check out their gallery to see all the work that has gone into preparing the pulling track so far this year. http://www.shakespearecountyraceway.co.uk/ for advanced tickets and information. Free camping and Pulling Party on the Saturday night with entertainment from the awesome Riff-Raff band. Looking forward to see you at the Shakey Super Pull 2011. Bear Essentials and Clarke Pulling Team visit Germany! Any plans for Bank Holiday yet? The two BTPA-Teams Bear Essentials and Clarke Pulling Team are going to take part in one of the biggest Tractorpulling-Show in Germany on May, 1st. 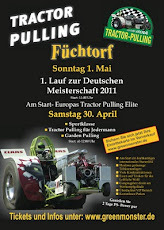 Check http://www.greenmonster.de for more information and tickets And here you'll find the competitors list.